Crossing the German Alps from west to east, from Lindau to Berchtesgaden, 359 (367) km, 22 (24) days. King Maximilian the Second himself traveled from Lindau on the Bodensee to Bergtesgaden on the Austrian Border. We read the year 1858. Germany is still a promise. You will have to walk the trail yourself, not like Maximilian who had his entourage of servants. 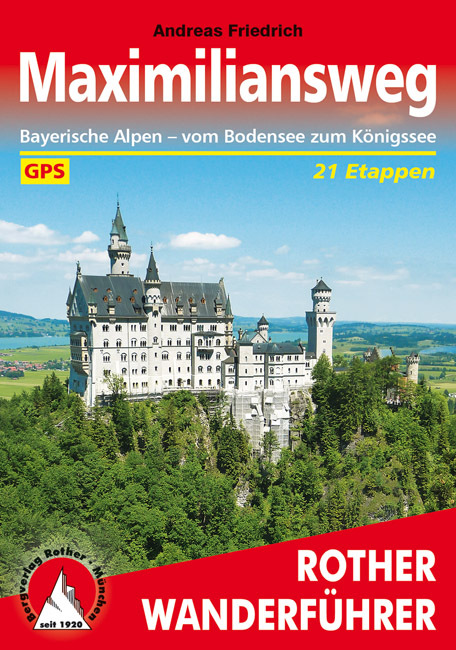 This path highlights a typical corner of Germany: baroque churches, old merchant houses, and the fantastic castles of “mad” king Ludwig like Neuschwanstein. From west to east the trail crosses the Bregenzer Wald, the Allgäuer Alps, the Ammergauer Alps, Wetterstein, the Bavarian Alps, the Chiemgauer Alps and the Berchtesgadener Alps. This southern part of Bayern, a beautiful mixture of rolling farmland, forests and views of the Alps, is enchanting to the wanderer. The trail comes in two varieties: a lower route (Jochroute) and a higher route (Gipfelroute). The Gipfelroute takes you into the bare rocks, like the Benediktenwand. The steeper parts are secured. Some easy climbing is involved. The summits often reach 1.800 m, sometimes 2.000 m. A sidewalk to Germany's highest mountain, the Zugspitze (2962 m) is possible. In many places the lower and higher route coincide. The trail is part of the European Long Distance Trail E4. As for the catering and lodging, you can be comforted: the trail is sprinkled with huts, and many of them are open all year, others stay open all summer until November. Positive The route goes through some fantastic scenery with views across Germany to the north and the higher alps to the south. There are lots of mountain huts for refreshment and a variety of alternative routes. In the valleys there are pretty towns with geraniums in window boxes, churches with funny spires, and castles. Negative The route is tough with ascents and descents of over 1000m most days, and after you have toiled and sweated your way up to many summits you meet lots of people at the top who took the cable car or cog railway. In September I found the route very busy with all the accommodation booked in some cases. There is a lot of waymarking but you rarely see any reference to Maximiliansweg. Good leaflet to start your research. Not very modern German website on the Maximiliansweg trail. Wandern mit Hans: his personal diary of the trail, map, pictures. This is a fine report if you want to understand what is written (English) and if you need some practical hints to get started. A "Wanderbericht": stages in may and october. Trail report with a lot of fine pictures AND maps in the end section. Would a walk this May be ok, will there stil be some snow high up.